Welch, Deborah and Michael Payne. "Fort Vermilion". The Canadian Encyclopedia, 11 May 2016, Historica Canada. 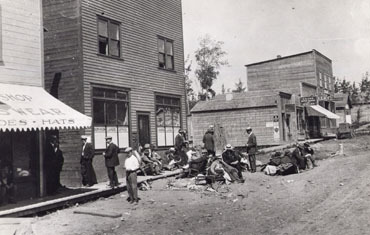 https://www.thecanadianencyclopedia.ca/en/article/fort-vermilion. Accessed 23 April 2019. Fort Vermilion, Alta, Unincorporated Place, population 727 (2011c), 714 (2006c). 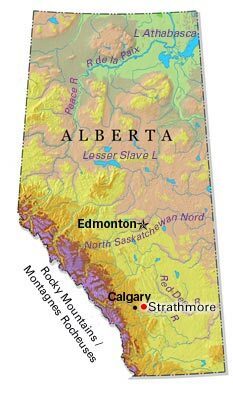 Fort Vermilion is located about 70 km east of HIGH LEVEL and is one of the communities of Mackenzie County. The name Fort Vermilion refers to the red ochre found in the area. The community of Fort Vermilion can trace its roots back to the establishment of Boyer's Post on the PEACE RIVER in 1788. This post was established at much the same time as the original FORT CHIPEWYAN, making Fort Vermilion and Fort Chipewyan arguably Alberta's oldest settled communities. In about 1831 the post moved to its present site. The site was chosen because it is located just west of Vermilion Chutes, a series of rapids and small falls on the Peace River and the major obstacle to water transport in the area. Throughout the 19th and into the 20th century, Fort Vermilion was an important trade and transportation centre. In the early 20th century, and particularly after the 1930s, the Fort Vermilion area attracted first Ukrainian and then Mennonite farmers who opened up one of Canada's most northerly farm frontiers. Today agriculture, forestry, and the oil and natural gas industry are important parts of the economy. 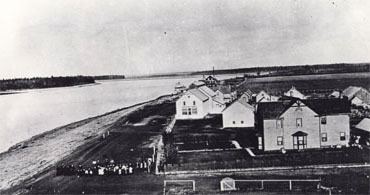 One hundred years before this photograph was taken (circa 1831), Fort Vermilion was moved to its present location on the Peace River where it developed into an important trade and transportation centre (courtesy Provincial Archives of Alberta/A5833).